Orders over $100 use code FREESHIPPING at checkout for free shipping. If you would like to pick up local in Fort Langley or Walnut Grove, email goatandpebble(at)gmail(dot)com to arrange a pick up time and use code LOCALPICKUP at checkout. *Please note, that if you require shipping and you use the LOCALPICKUP code, the item will not be shipped. Goat & Pebble Co. creates limited edition, hand printed art, that is wearable, usable, & unique. We are currently expanding to include rughooked throw pillows as well as hand made heirloom quilts. 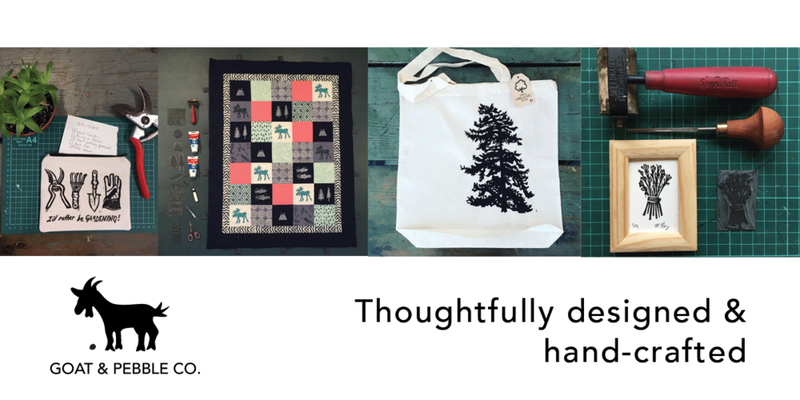 All handmade products are created just outside of Fort Langley, B.C. by Molly Gray. For more about us, click here. Check out our sale items here. Once these designs are gone, they’re gone for good. We mean it when we say our hand printed creations are limited edition. Free shipping on orders over $100 within Canada.